Men and women have separate bathing areas so we didn’t even enter on the same side as Zach and Rudy. First we were given a locker to put up our clothes and purses, a peştamel to cover up, and plastic sandals to wear into the hamam. 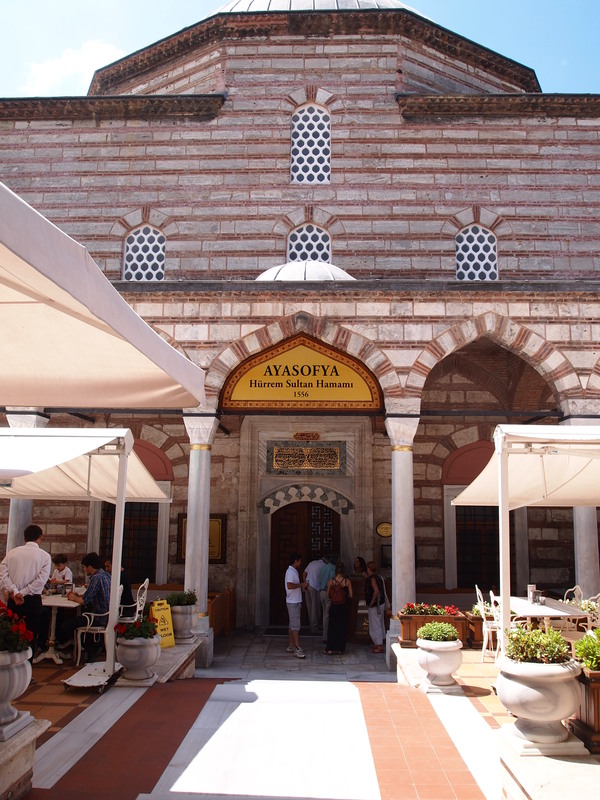 Then we were directed into the hamam – hot room first. There were two other women being massaged at the moment so first we were each seated next to a sink each with two faucets running scalding hot and ice cold water. There we were doused with water by our masseuses and instructed to steam and continue to pour water over ourselves. This we did for a while until our masseuses were ready to begin our treatment. First we were taken into the warm room. Seated next to another sink, my masseuse used a bath glove to scrub me down. She scrubbed vigorously and was pretty thorough. It’s been a long, long time since another person has bathed me. After she felt she had sufficiently cleaned me up she doused me with water again – head to toe. Then we went back into the hot room for the bubble massage. We laid down on a raised octagonal platform that was heated underneath with hot coals. The masseuses took a linen cheese-cloth like sheet about the size of a pillow case filled with bubbles and swung them to create more bubbly suds before squeezing the excess out on us. Then with olive oil soap they washed and massaged first our fronts and then our backs. After each set of suds we stood up to be rinsed off. Finally after we were scrubbed and washed clean, we moved on to the final phase of our treatment – a hair wash. They massaged the shampoo and conditioner into our hair while we sat next to another sink and again, doused us when they were finished to rinse it all out. Then we were wrapped in towels and led back out to the lounge to rest and drink some sherbet (a relative of the agua fresca). It was immensely relaxing. I don’t think any of us were quite ready to leave, but we had arranged to meet Tim at 11:30. 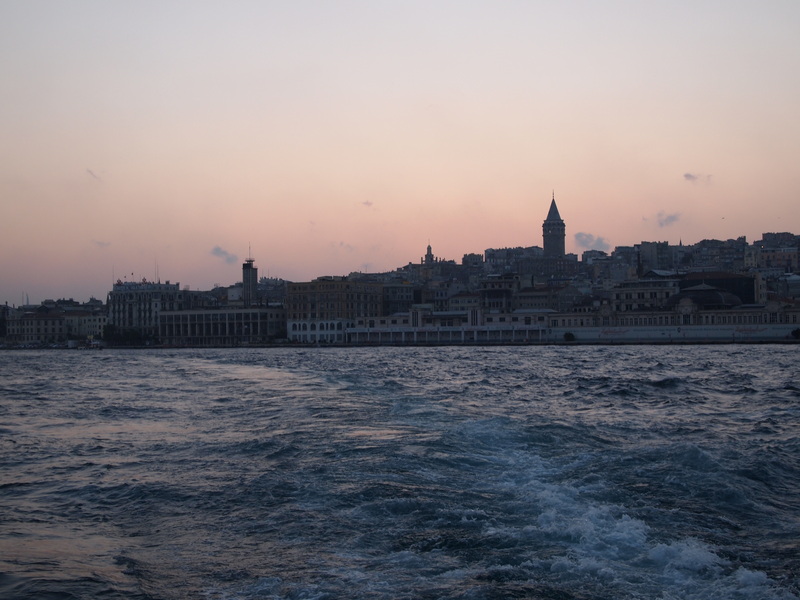 Tim had gone to a different hamam – Çemberlitaş Hamami – and did their self-service bath where you can go steam and bathe yourself. 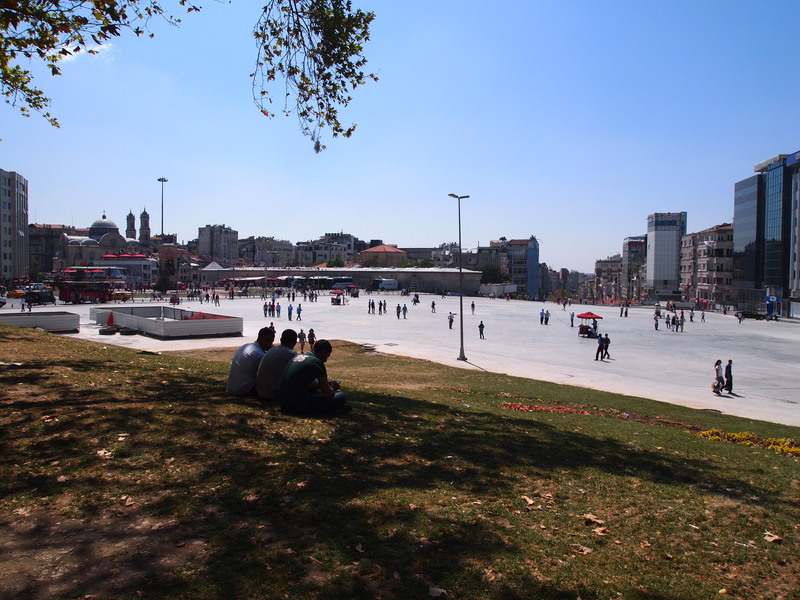 After leaving the hamam we decided to grab lunch nearby and then go check out Taksim Square. 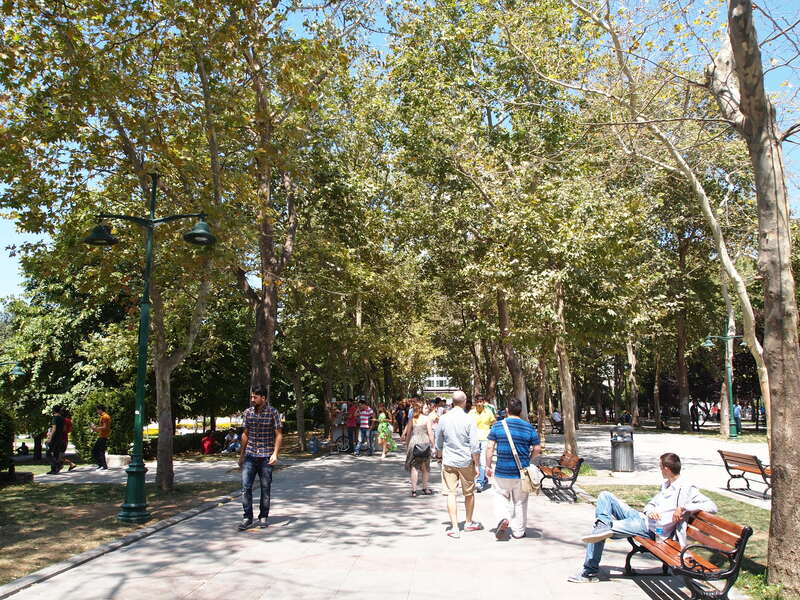 Taksim and Gezi Park were pretty quiet. 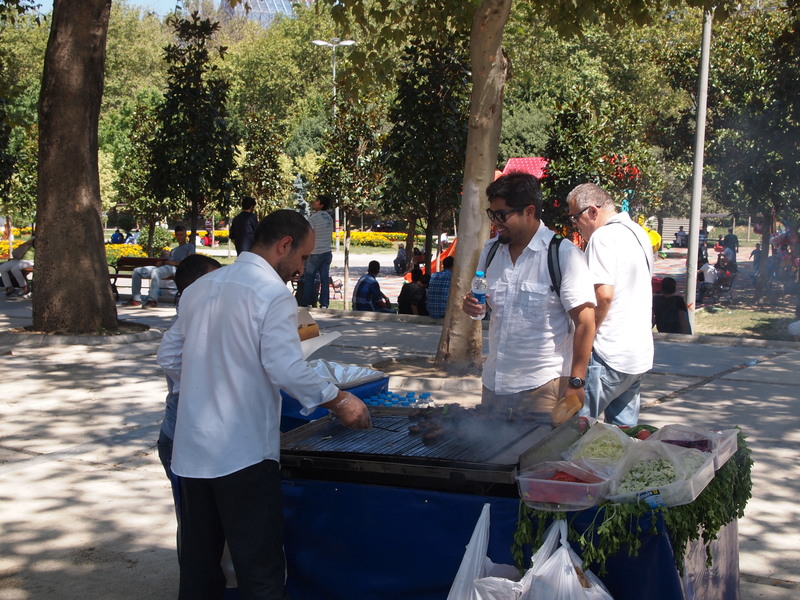 The park was full of vendors selling food and water, trinkets, and even tea and coffee. It’s a pretty park and a nice place to relax away from the all the people. 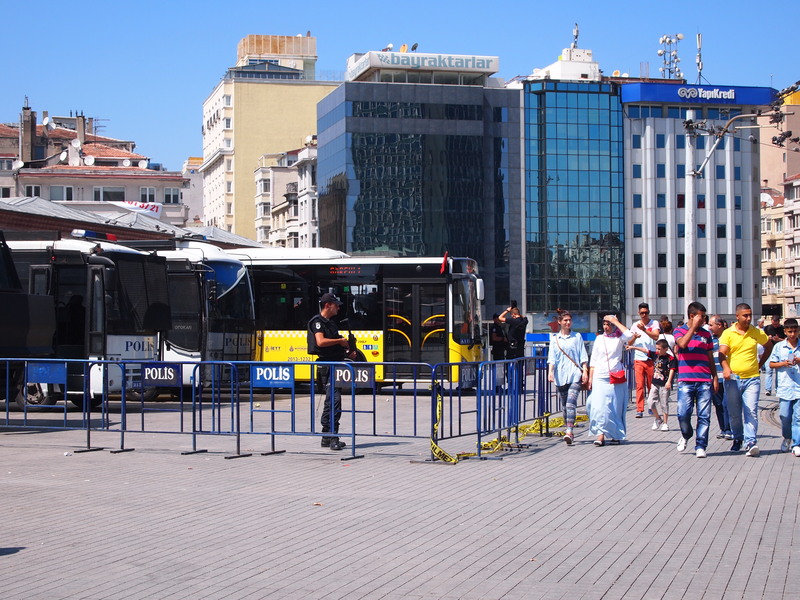 There was a police presence in the square, but they weren’t engaging with anyone. 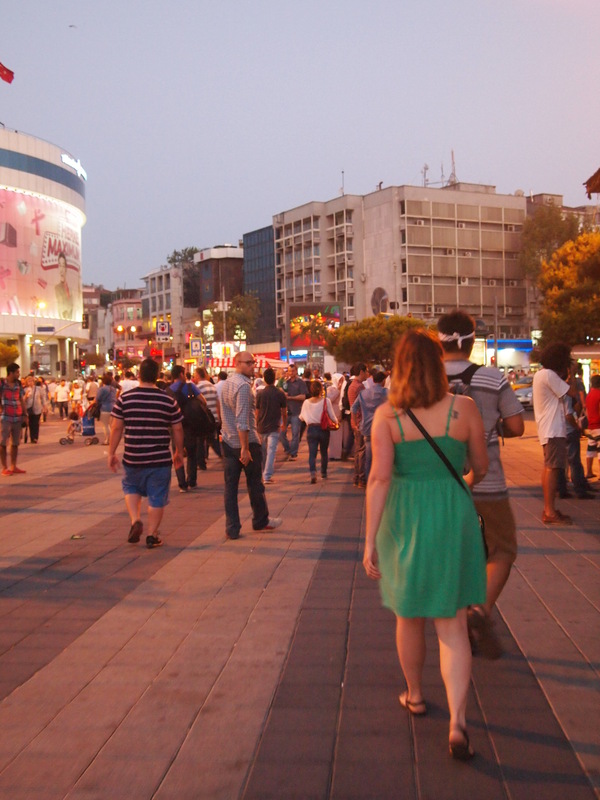 Taksim Square meets one of Istanbul’s busiest streets, Istiklal. 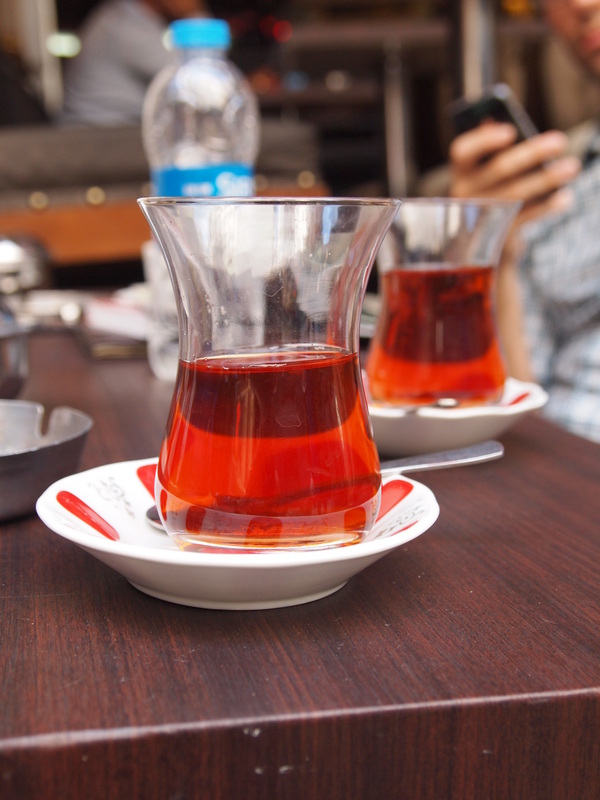 So we strolled down Istiklal which was filled with people celebrating the end of Ramadan and ended up stopping for tea to get out of the crowd. 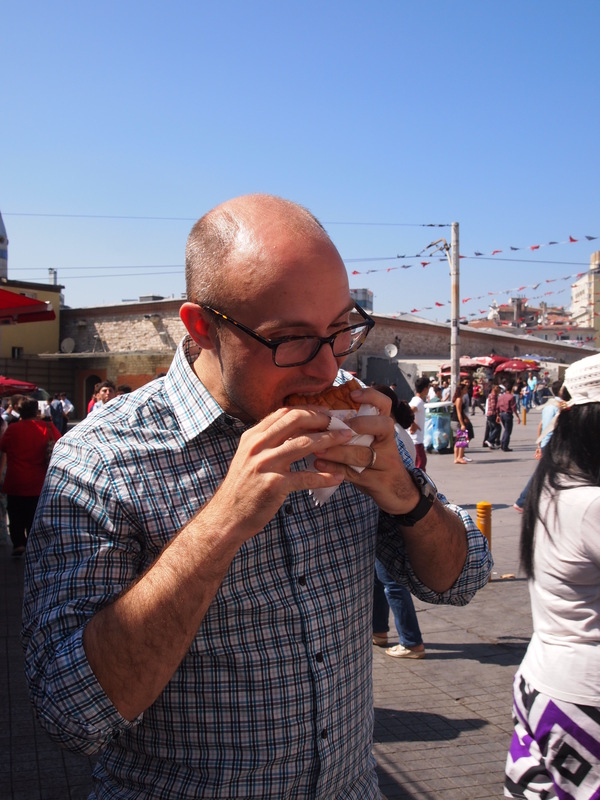 Tim wanted to find the wet burgers that Anthony Bourdain had eaten on his episode for Istanbul so we tracked them down in Taksim Square. Zach, Rudy, and Tim all ate one. I just tasted a bit. It was like a chorizo sloppy joe. 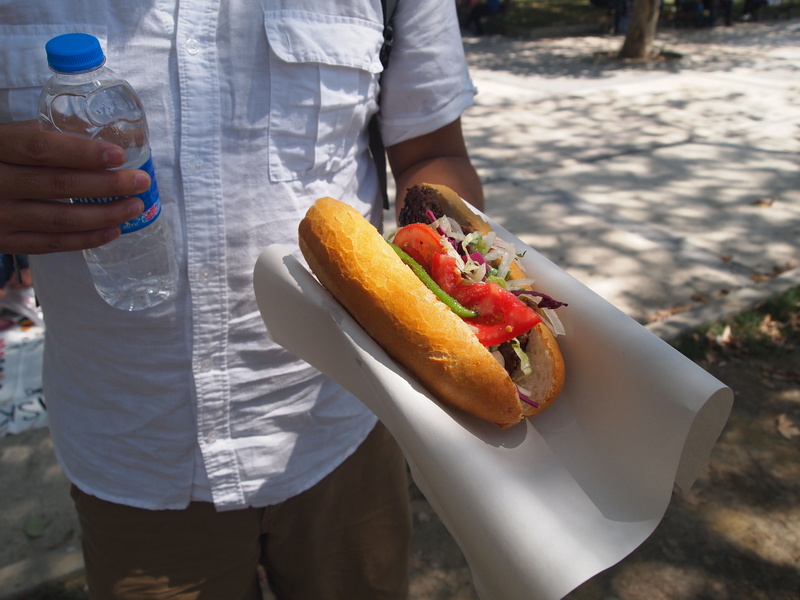 Surprisingly the bun really wasn’t that wet and it was pretty tasty. 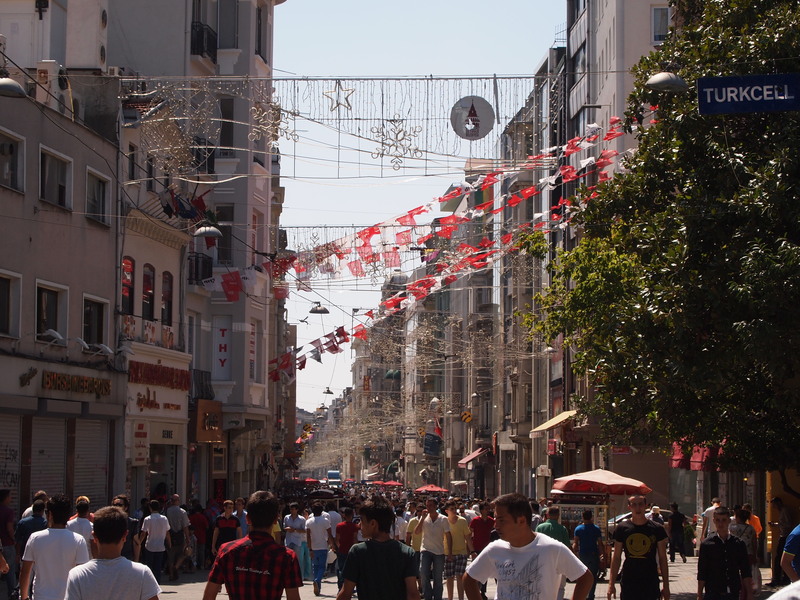 After that we continued our walk down Istiklal and ducked into some shops every now and then to do some shopping. 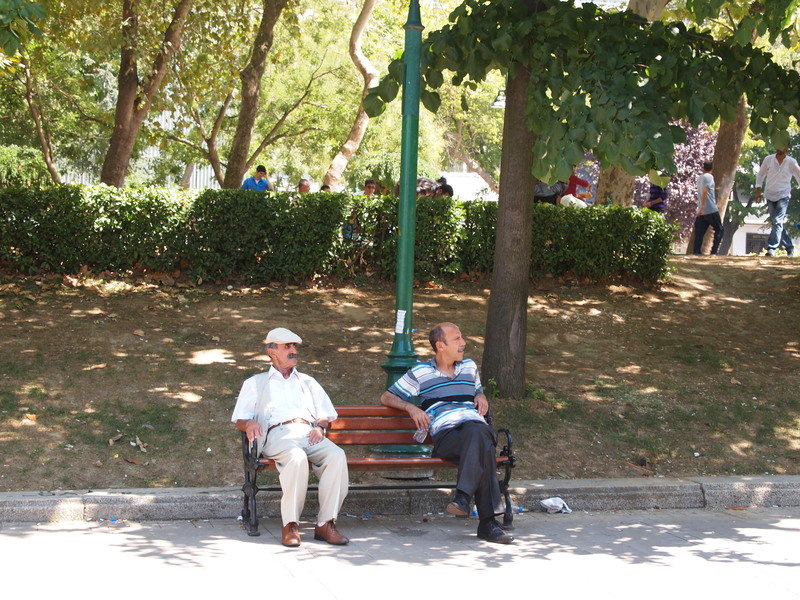 We came back to rest while Zach squared away the details of our trip to Amasra on Sunday. The rest of our evening was very calm. Zach, Jenny, and I went out and had a nice dinner then wrapped it up with a Guinness at a quaint English pub. Tim and Rudy found some food too and then we all met back up at the apartment to call it a night. 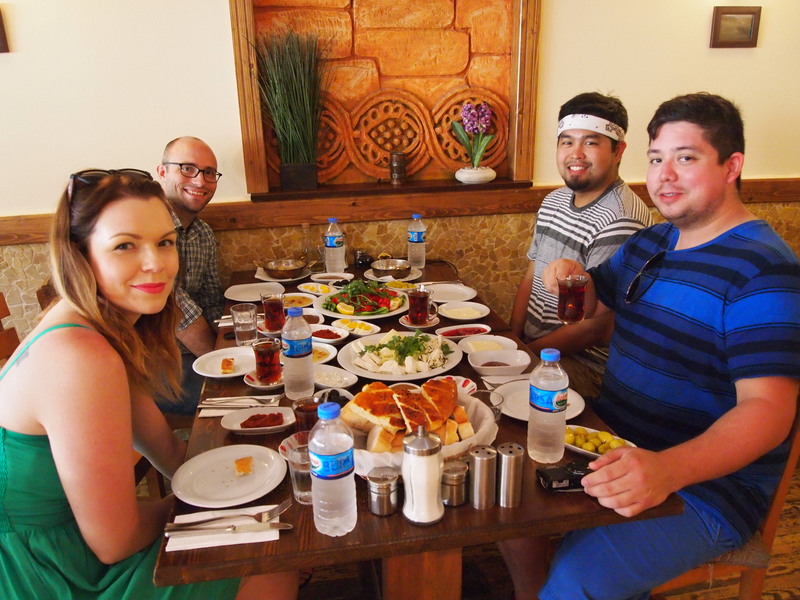 This morning we slept in a little and then decided to go have a Turkish breakfast. 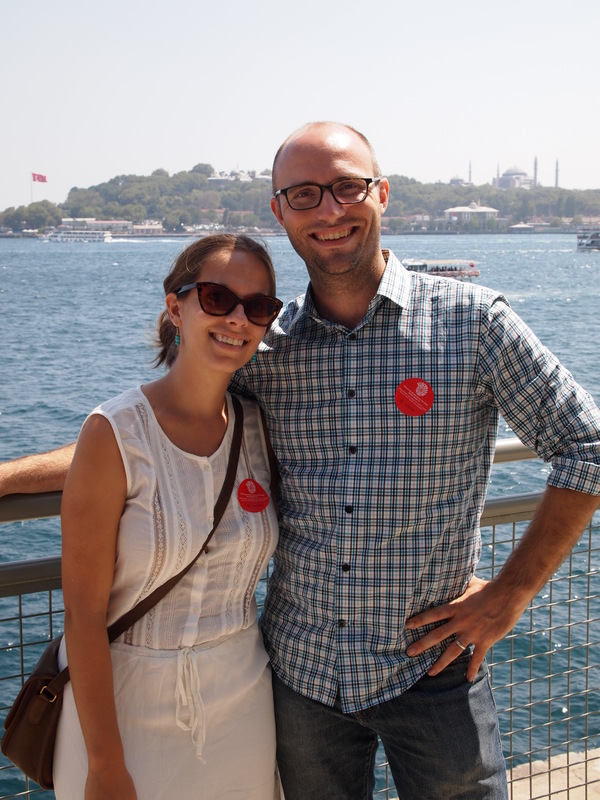 We ended up at a great place – Van Kahvalti Evi. 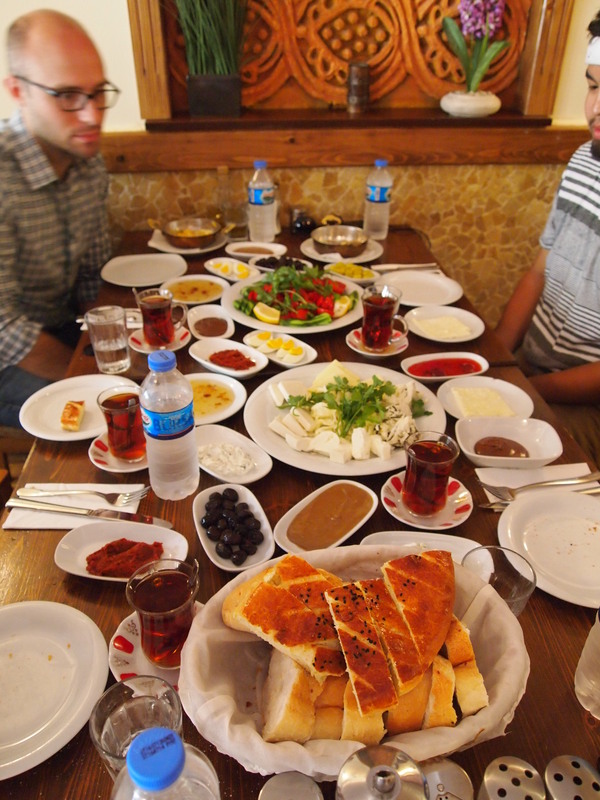 We got the whole spread – tomatoes, cucumbers, a lot of different cheeses, some delicious bread, strawberry jam, nutella, a peanut sauce-like spread, honey, clotted cream, hard-boiled eggs, and more that I can’t even remember. 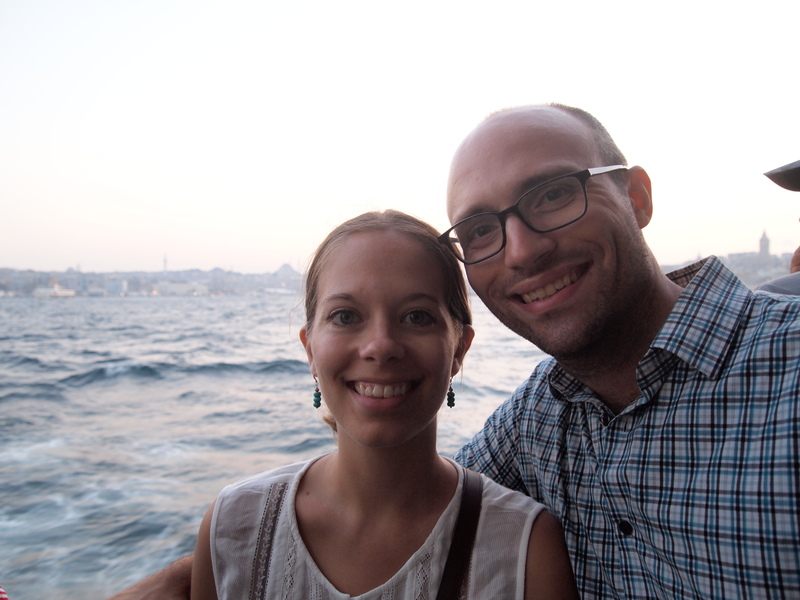 It was really wonderful and was accompanied with as much Turkish tea as we wanted! 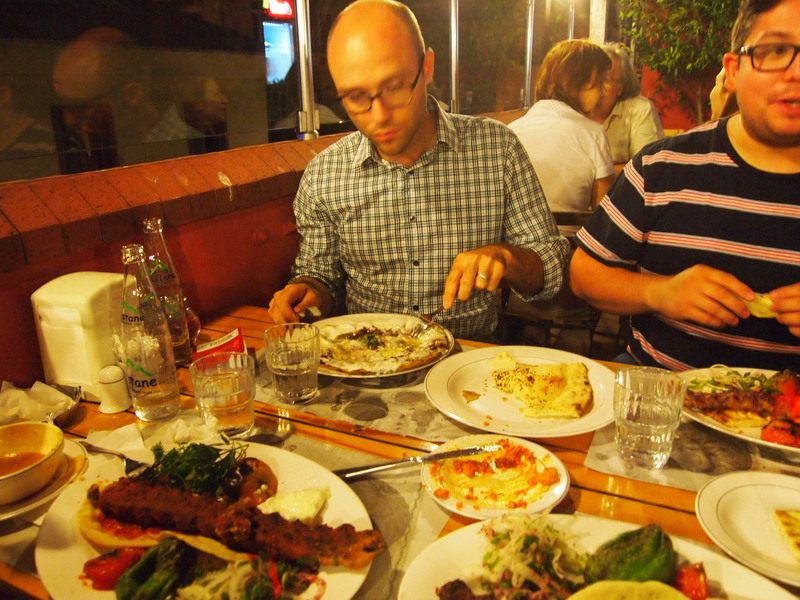 The place was pretty small – 6 tables inside and more out on the sidewalk patio – but the ambiance was really pleasant. The guys working our table were warm and incredibly attentive. It’s definitely a place I wouldn’t mind visiting again. 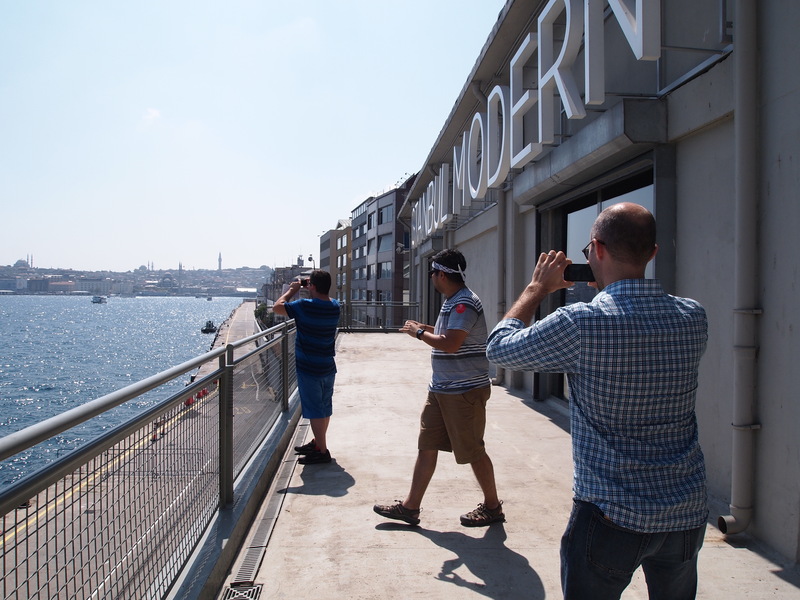 After breakfast (which we ate at lunch time) we walked over to Istanbul Modern, the city’s modern art museum. 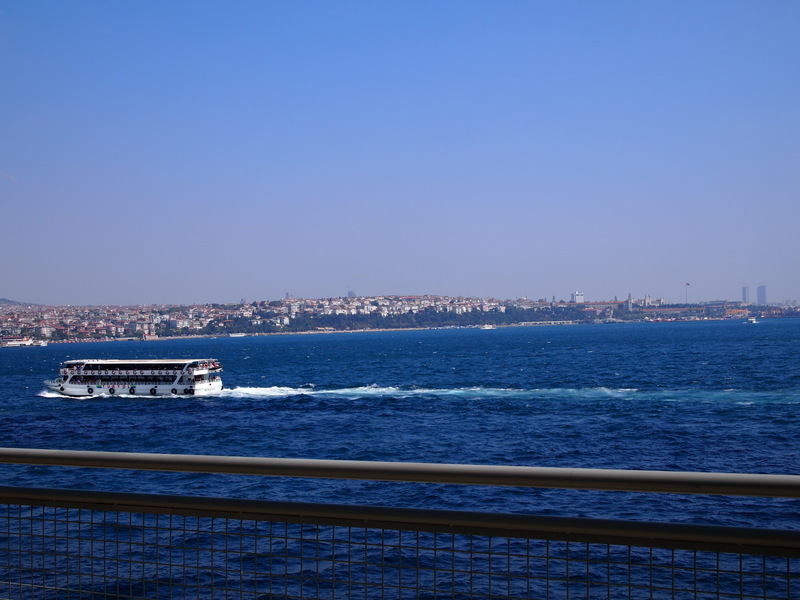 It sits right on the Bosphorus and has a fantastic view of both continents. We spent a few hours studying their collection and admiring their view. 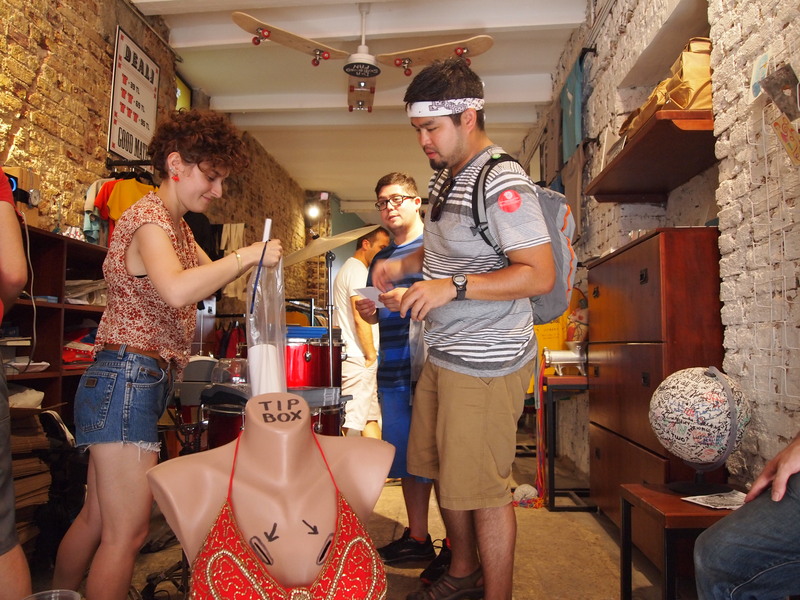 On our way back to the apartment we did a little shopping and discovered a hip coffee shop/store. Supermind Coffee definitely had an Austin vibe. The owner was wearing a Heartless Bastards hat and was pleasantly surprised when we told him we were from Austin. We chatted with him for a while. 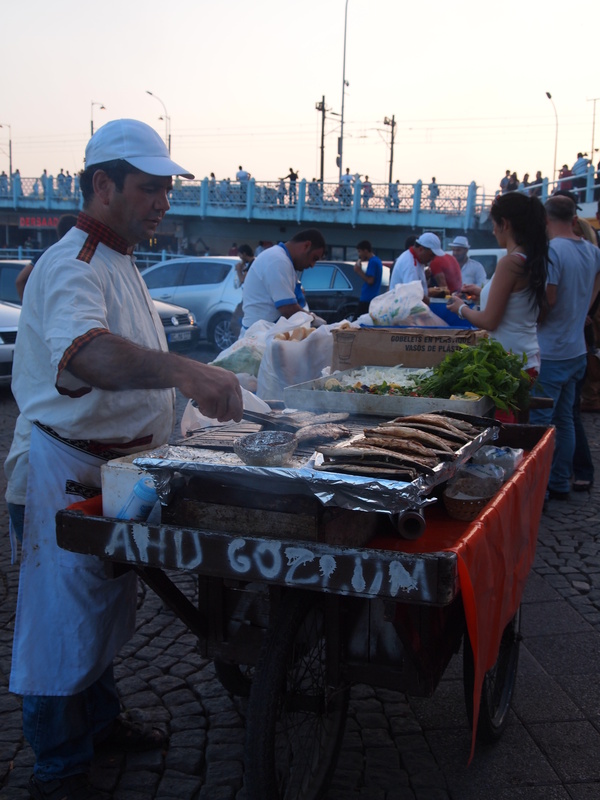 We’ve met a lot of incredibly friendly Turks and he was no exception. We even saw him on our way to dinner later and he gave Rudy the postcards he had forgotten. I think we are going to stop by and have some coffee in the morning. 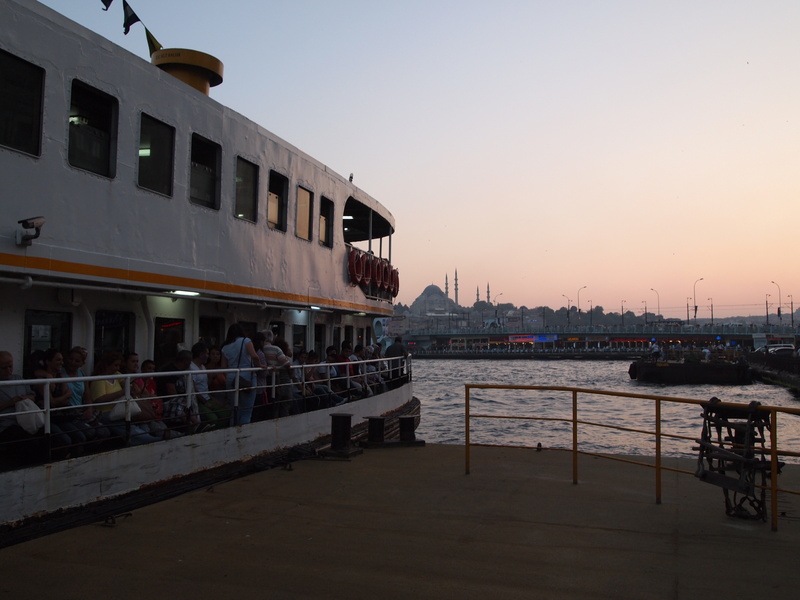 For dinner we took the ferry over to the Asian side of Istanbul. We tried to time it so that we could see the sun set over the city. 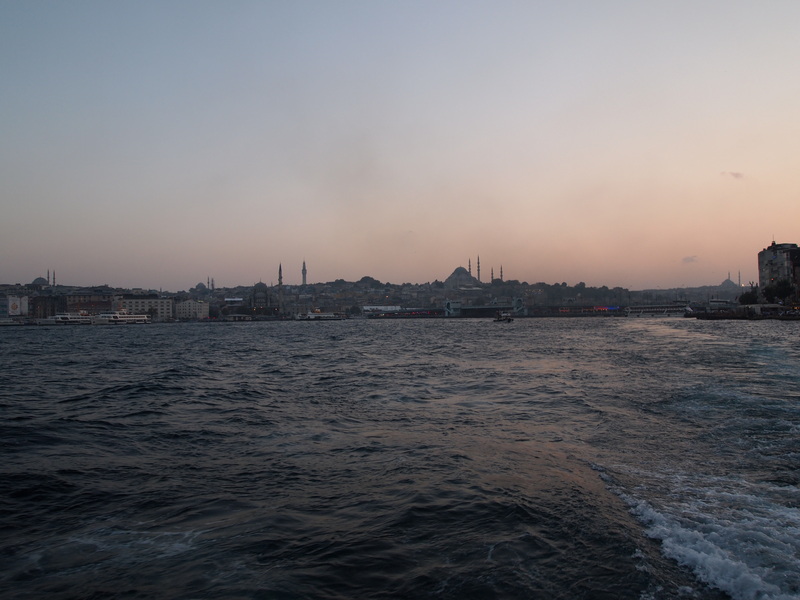 We caught most of it as we sailed out of the Golden Horn and into the Bosphorus. 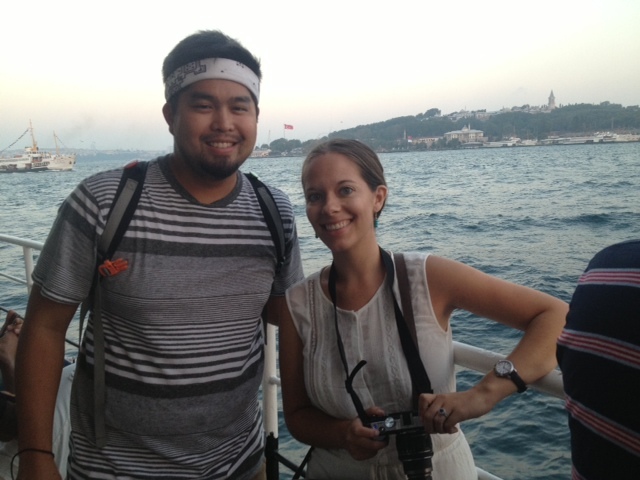 Fatih, our Airbnb host, gave us a restaurant recommendation – Ciya. 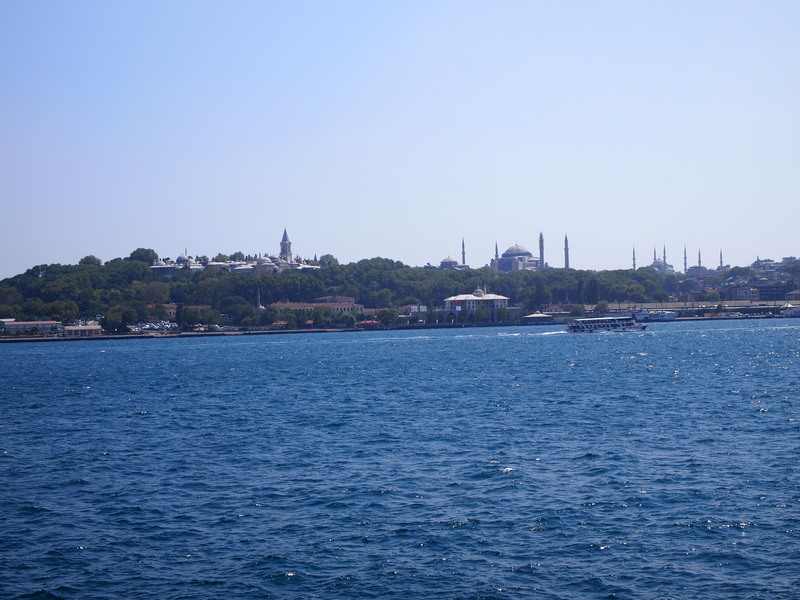 So we headed there once our ferry docked. It’s a pretty lively scene off the coast. 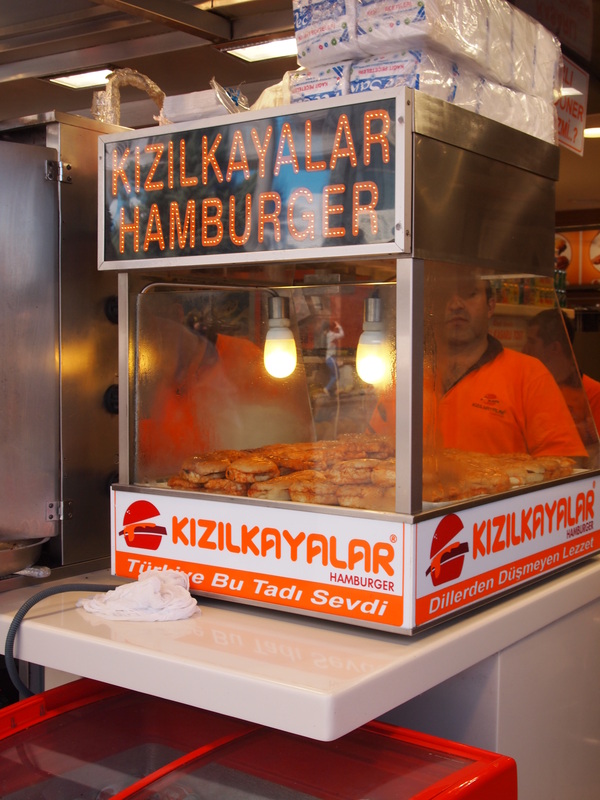 There are a lot of restaurants, bars, nargile lounges, and general entertainment in the first several blocks. Ciya was a little ways in, but wasn’t disappointing. 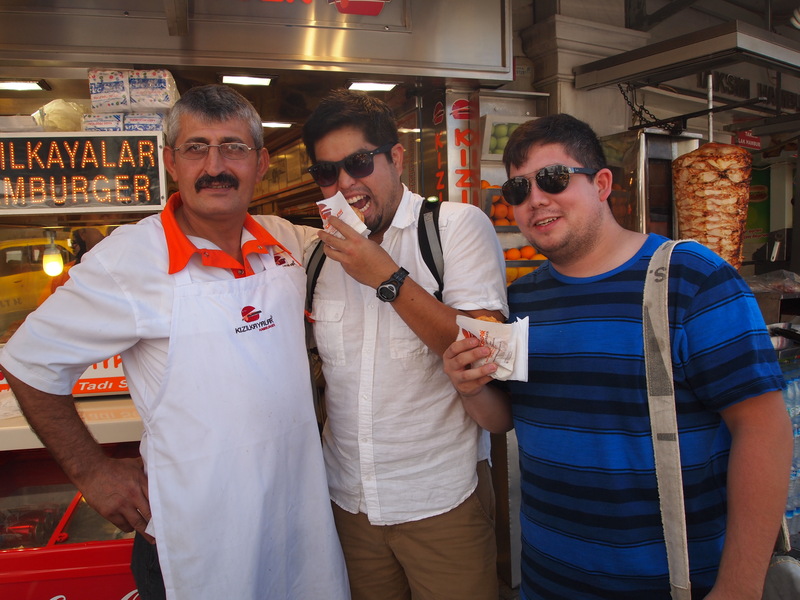 We sat up on their terrace and enjoyed several different kebabs, an interesting pumpkin dessert, and some baklava. 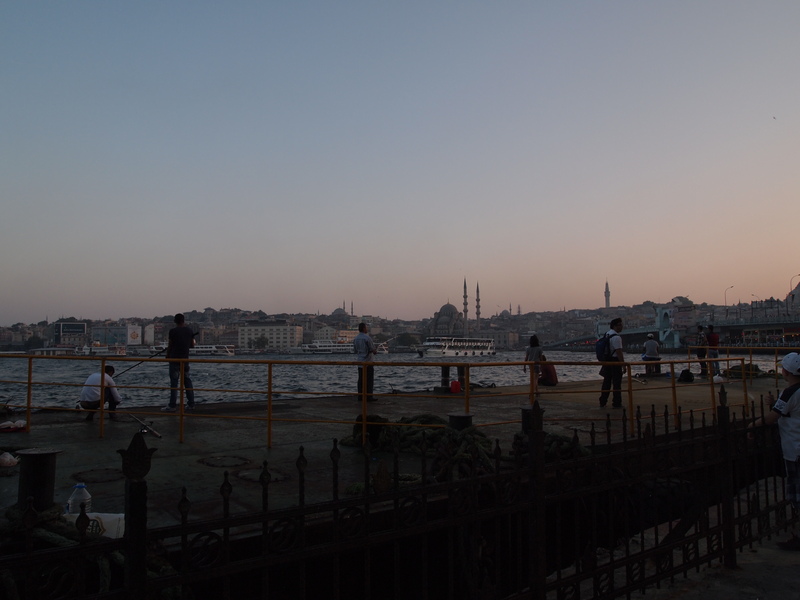 We went back to the ferry to ride back over to the European side and are now relaxing at our apartment planning our final day in Istanbul.